As the final seconds ticked away in Lawrence’s Eastern Class A semifinal game against Edward Little of Auburn, Lawrence coach Mike McGee raised his arms in victory, knowing that with his team’s 49-41 win, he’d have at least one more game. AUGUSTA — Once the tournament started, Lawrence boys basketball coach Mike McGee knew each game could be his last. 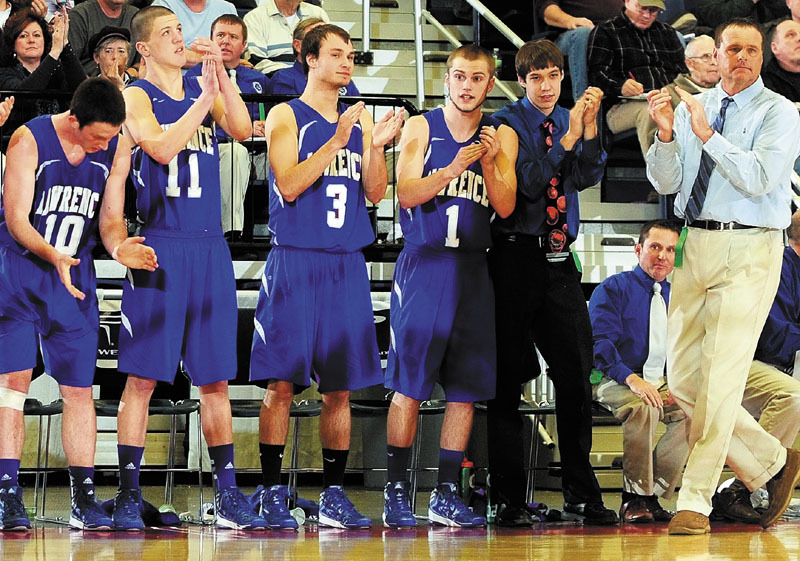 The longtime coach of the Bulldogs announced earlier this season that this would be his last on the Lawrence bench. As the final seconds ticked away in Lawrence’s Eastern Class A semifinal game against Edward Little of Auburn, McGee raised his arms in victory, knowing that with his team’s 49-41 win, he’d have at least one more game. The win was the 350th of McGee’s career. The No. 3 Bulldogs (16-4) will face either No. 1 Hampden Academy or No. 5 Lewiston in the regional championship game at 8:45 p.m. Friday at the Augusta Civic Center. Edward Little ends the season 17-3. Ahead 34-32 with just under six minutes to play, Lawrence went on an 11-2 run to take control of the game. Mason Travers, who scored a team-high 14 points, made an uncontested layup with 3:11 to play, giving the Bulldogs a 45-34 lead. Travers looked surprised to find his way to the rim completely unguarded. “I was going to dish it back off to Spencer (Carey) because I thought the guy was going to come back on me, but he didn’t,” Travers said. Lawrence led 17-15 after a slow-paced first half, the Bulldogs took advantage of an Edward Little defensive switch. The Red Eddies began to press the Bulldogs full court, and that played into the experienced Bulldogs’ hands. “We were struggling in our man halfcourt. They went full court, and I thought it opened things up for us. We’re a senior-laden team, nine seniors, and we’re a really good passing team. We got some nice open shots,” McGee said. McGee called the Bulldogs’ defensive effort its best of the season against a quality opponent. Lawrence played man-to-man throughout, and made a point to face guard Lew Jensen, who scored 20 points in the Red Eddies’ quarterfinal win over Messalonskee. Jensen didn’t score at all against Lawrence. “We played our base man, and face-guarded (Jensen) so he got no looks. We’ve seen enough of him shooting threes,” McGee said. Lawrence held Quin Leary, the Red Eddies’ Mr. Basketball semifinalist, to nine points. “We probably could’ve done a better job of moving the ball around. Again, it’s a tribute to their defense. They were getting out and taking passes away,” Adams said. Sean Ford scored 13 points for the Eddies. Both Ford and Leary, Edward Little’s top two players, fouled out, Ford on a charge with 2:45 to play, and Leary with just over a minute remaining. “We’ve been working on our defense quite a lot this week, just because we know (Leary’s) such a good player. It was a whole team effort,” Travers said. Carey, also a Mr. Basketball semifinalist, scored 13 points for the Bulldogs, while Xavier Lewis added 12.